AiroNet is a new local Internet Service Provider and we want to improve your internet experience. We provide Top Tier Fiber backed service over the air directly to your home or business. We don’t set limits on how much data you can use…really. Some providers limit your data usage and charge you overages or slow down your connection when you go over a limit – we don’t. Because of how we deliver the internet, we can reach where others can’t, and we are always working to expand our coverage area. Request Service and we will come survey your area to see what it will take to get you connected. 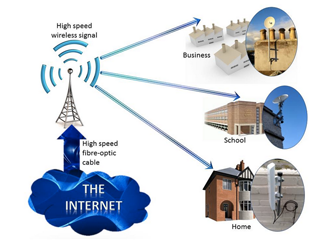 AiroNet offers high speed residential internet service to rural areas around Washington, MO. Our residential internet service can go where others can’t, so you can enjoy super fast, high speed connections for downloading music, browsing the internet, or streaming movies, television, and sports in your home. Request service today to get started. AiroNet offers high speed business internet service to rural areas around Washington, MO, so your business can enjoy a super fast, high speed connection. Request service today and we’ll survey your area to see what it will take to connect you.